for a really long time! The Police have been looking for him. The Mounties have been looking for him. Even the Firefighters have been looking for him! But somehow, they just can't find him. . So now it's up to US! are gonna have to go save A.G. Bear themselves! And we're gonna get him OUT! Wait! Who IS A.G. Bear? Help us rescue A.G. Bear! Join the search party or just send words of encouragement. Include a picture if you like. Send your note to getAGBear@bedtime-story.com. Do you have an A.G. Bear or a member of A.G.'s family living at your house? Tell us! My name is Lauren. I live in Miami, Florida. I'm in second grade and I've got A.G.'s sister Bearonica living at my house. Please go get A.G. Bear ! My name is Bob Baruch. I had purchased two bears a few years ago near Toronto, Ontario . Those were the only two I have ever seen. I gave bear one to some friends kids years ago. I kept the other bear until just last Friday. I gave bear two to a friend from work who needed something special to keep her child entertained on a long plane flight. When I took A.G. to work, I couldn't believe how many parents wanted an A.G. Bear of their own. I didn't realize other people were looking for A.G. as well. I'll join the search & rescue party! Save A.G. Bear! Hi, I'm Tchad Taylor from Florida. I am six years old, and I am ready to find A.G. Bear. I thought I saw him at the supermarket, but it turned out to be a lost puppy. I was lost once, and it does not feel good, so count me in, I'm ready to find that bear!. Judi Anderson, from Judi's Whimsies - Columbia, S.C. - We have had the good fortune to be owned not by ONE member of the A. G. Bear family, but FOUR AG's. (A.G. stands for A.Good Bear) Of course, each had its own personality! A G. Gray Bear was the first to join our home. He was soon followed by Baby AG and then we found Grandma and Grandpa AG. They HAD to come live with us so that they could look after the youngsters! We always enjoyed listening to their conversations. We would put the four of them in a huggle and they would talk to each other for hours! Even when we moved from Maryland to South Carolina, and they had to be caged for the trip, they talked alllllll the way down the road. You should have seen the expressions on the movers' faces when they moved the boxes that TALKED! Just today, AG Gray Bear and Ag Baby were adopted by someone who really needed their comfort even more than we do. They are going to travel to Virginia to help their new person recover from some serious surgery. We are happy that they can continue to spread their love where it's needed!! Everyone should experience the pleasure and privilege of being owned by one of these wonderful little creatures! Go Get Him! Cynthia Gurin of Summerland Engineering in Stuart, Florida. I bought A.G. several years ago for my kids. Once I got him home and heard him talk I couldn't bear to part with him. Then, of course I felt guilty and had to go get another. I think we ended up adopting six or seven, giving all but two away as gifts. My husband and I kept A.G. and Bearonica. Fortunately we speak fluent bear, so we understand what they're saying. Looks like there's no choice. Bedtime-Story kids, you've simply GOT to go in and save A.G. Bear! We'll help man the search lights! Hi. I'm Bill Webb, of Webb & Associates, Inc. Construction , and Coronet Realty from Miami, Florida. A.G. Bear came to stay with our family about five years ago. This is one seriously cool little guy. I've got my flashlight ready. LET'S FIND THAT BEAR! Hi, Jeff Meyers here, I'm a writer and artist from South Carolina who has been looking for A.G. all over the place, from Wakamaroon to Stiltslyville. The poor little guy has got to be getting worried, but don't you fret...we'll find him. Come along. Grab your flashlight, ropes, maps and lucky charms. Together, we can get A.G. everywhere he belongs. Yvonne Augustin writes, "Hi, my name is Yvonne, and I live in New York. I teach school, and I have all of my students on the lookout for A.G. Bear. You can be sure if he's in New York, my students will find him. Virgil I. Grissom has the best students in the world. we are all ready to join the search for A.G. Bear. We are collecting flashlights and compasses even now, so lets all do what we must, and find that bear!" Gary Blake is 42 year old freelance writer from Summit Hill, PA., in the hardcoal region of northeastern Pennsylvania. Gary writes; "If we think real hard and remember how we felt when we were small and lost, maybe A.G. Bear can follow our wishes back to his home. Let's all of us remember how happy we were when we got home". Gary and his wife Judy, sons Daniel 14, Patrick 12, and cats, Goofy and Nina. Listen for our Wishes, A.G. Follow them Home! My name is Mike Loomis from Stuart, Florida. I'm a retired firefighter. I've got A.G.'s brother B.G. Bear living at my house. He sits in a chair in my living room and talks to my buddies when they stop by. Everybody loves this little guy! Hi, I'm a bookkeeper, writer, and mom. My family has joined the search party to find A. G. Bear. My husband Mike and my daughter Alyssa are handing out the flashlights, and my dogs, Nala and Winston are carrying packs of supplies!! Don't worry, A. G. We're coming!! DON'T WORRY A.G.
My name isMargaret Krakowiak, I am an animator/illustrator and I have had a bear for years and years. I had no idea A.G. was lost. When I told MY bear he immediately volunteered for the search, knowing how much a bear needs a cozy home and how sad and scary it is to be lost and alone in the forest. I'm with him - we'll find you, A.G.! John Rickey is a second grade teacher from Pontypool, Ontario, Canada. He writes that he and his class were upset to learn that A.G. was lost. "We know A.G. must be hungry, so we've made all sorts of food that we know he likes.One sniff and we know he'll be back. Surely his super sniffer can smell our bluebearry muffins, or our beckoning blackbearry jam and our most scrumptious bumblebearry pie. We love you bearry, bearry much and will look furever fur you, claws we love you.--John Rickey & Room 108" WE LOVE YOU A.G.! David McComiskey, 13, from Newfoundland, Canada writes; Hi, I saw A.G Bear a few days ago, and he's one cool bear, not to mention that he's popular! We can't let such a tragedy happen. I'll look for AG Bear! - David I'LL LOOK FOR A.G.! Hi, my name is Kristina, and I am five years old. 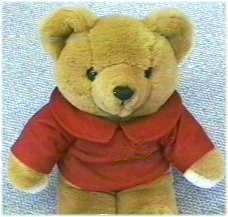 I live in Philadelphia, and I would like to help search for A.G. Bear. His cousin, Beariffic Bear lives with me, and I love her to pieces. Let's all go out and find that bear! LET'S ALL GO OUT AND FIND THAT BEAR! Kim Rowell from Nature Coast Inc. writes: Hi, Beary special friends. I don't really know bear language, but I do have Grandma A.G. Bear. However, I need help in learning bear language, so I can help search for A.G. Bear. If you have any instructions or information on Grandma A.G. that can help me to understand bear language, then maybe I too can help in the search for A.G. Bear. I do believe that all bears wonder away from home at one time or another and I also believe that A.G. Bear will come home wagging his tail behind him. Beary Truly Yours, Kim Rowell - Tallahassee, FL. I CAN HELP SEARCH! Rob Keller of Alberta, Canada writes: My family and I are setting honey pots by watch stations in the forest. We will check the honey pots daily. A.G. must be getting hungry now. Hang on A.G.! HANG ON A.G.! Hi, Our names are Zachary and Alissa from Fontana, Ca. We want to help find A.G. Bear. Our mommie Geri Miller is an investigator and she will help in following all leads to find A.G. Our daddy travels alot, so he can help with the search as well. We will have our dog Nicki help out too! We want to help find A.G. Bear too! Hi, we are Mr. Wilson's class in Kansas City, MO. We are learning about animals in science and have a camping theme in our class, so we spend a lot of time in the woods. We are going to be on the look-out for AG Bear wherever we are. Let's go get him, kids! My Dearest Bear, My name is HALA El-Masry, I live in Egypt.. It is so far from the area that A.G. Bear is lost in, that I can not search with you but I hope you will find him very soon. Yours, HALA Mohammad Ezzat Ahmed Mahmoud El-Shamy FIND HIM SOON! A.G. Bear, I miss you sooooo much..My name is Kelby, and my sister Bailey and I want to join in the search to find A.G.
A.G. Bear my name is Bailey, I think you are an Angel...and I would love for you to come to our house one day...We are in the search to help find you. We will search everywhere til you are found..we will not give up til we bring you home safe. COUNT US IN! FLASH! - A.G. Bear was spotted giving Margaret Henry a hug. Margaret writes; GOD BLESS YOU, YOU'VE SAVED MY LIFE! I'M 67 YR OLD WOMAN RECOVERING FROM 2 MAJOR SURGERIES IN 4 MONTHS. NO CARDS FLOWERS, PAINKILLERS OR VISITS HAVE COMFORTED ME AS MUCH AS A G. BEAR! What a Good Bear! Ruth Malloy writes, "I really hope you find your bear. I would be very upset if I lost my old tattered friend, whom I affectionately call Wozzle-Bear. FIND THAT BEAR! The Davis Family Writes: "Count us in-Tyler and Kristi Davis, and their Mom-Diane, And Dad-Larry. We want to help find A.G.Bear. We think he's a special guy and we're going in to help find him!" COUNT US IN! The Farrar Family writes: I was amazed and delighted to find a site dedicated to A G Bear on the Web! We have such a bear, named Mumbles - no explanation needed! - whom we adopted on 8 October 1986. My wife was temporarily immobilized owing to an accident at work, her father had just had a heart attack, and I was working away from home for about eleven weeks. Mumbles provided excellent company for my wife, even though he did tend to respond to passing trains in the middle of the night - he was younger and more responsive then! Since then, he has adopted the responsible role of Bear in Chief, in charge of the other bears' finances - they get paid pocket money and have Premium Bonds - and other day to day administrative matters. We subsequently adopted another of Mumbles' companions, who is officially known as A G Baby, although, for equally obvious reasons, we call him Churgles. We have slightly over 520 teddies in our collection, although space prohibits us from adding many more to our already overcrowded house. Now that we have found a picture of A G Bear, Mumbles can have his own Web Site! - Regards - Mark (and Carol) Farrar. FIND A.G.! Peggy Hunter writes: How will it be possible to bring AG back? I will be more than happy to do what I can. I just met this loveable little fellow last week. I am making an outfit for him for a friend, and I dread the time I have to give him back. I want one of my own. Please let me know what can be done. I an older woman who has never been big on stuffed animals, but AG is different...... I am expecting some Grandchildren and think he would be..wonderful ... for them too! What can be done to bring AG back?..... -- Peggy Hunter BRING A.G. BACK! THIS JUST IN: - A.G. Bear appears to have been spotted in Italy . He told the young lady, (on whose lap he is shown sitting), that he wandered out of the woods near somebody's house, saw some luggage sitting next to a car, and being quite tired, crawled inside what looked like a nice warm briefcase to take a nap. Next thing you know, he woke up in Rome!!. The very surprised briefcase owner saw to it that A.G. was well fed, and a very nice Italian family provided A.G. with a stylish teddy bear parka and matching boots. At right A.G. is shown holding a glass of sparkling mineral water. Soon afterwards, A.G. told his new friends that if they would kindly take him to the airport, he planned to catch the next flight back to America. Unfortunately, nobody remembered exactly WHERE that next flight was going!!! Oh my goodness!! A.G. Bear has a perfectly terrible sense of direction!! If he just got on the next flight, he could have ended up almost ANYWHERE!! That means he's still LOST!! - Keep looking, Bedtime-Story Kids!! He could be in YOUR town! Hello, My name is Matthew Hertler. 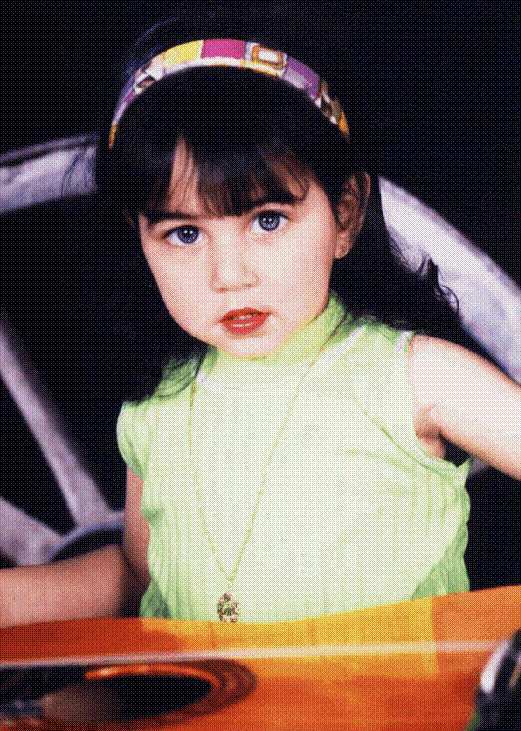 I am 15 years old now - but when I was at the age of 1 or 2... I received a best friend!! A.G.!!!!!! He was the greatest... I would feed him at dinner and play with him and my Hot Wheels cars!!! But then his family disappeared from the toy stores. A.G. has traveled with me across the whole East Coast of the United States!!! A.G. has been on Planes and trains to Florida and a car to Maine! He has been Whalewatching and Disney World! EVEN DOLLYWOOD! When we lost his red shirt my sweet mother made him a knitted shirt.. which he still wears today!! I love my bear and I have kept him for 13 or 14 years... he was practically born with me... and he will be buried with me when I die! HELP SAVE A.G. - THE TALKING BEAR!!!!!!!!!!!!!!!!!!!!!!!. Hundreds upon hundreds of letters continue to pour in, and although we don't have the space to print all of them, A.G.Bears friends and family wish to express their sincere appreciation to the search teams and volunteers worldwide who are working to bring A.G. home safe and sound. WE KNOW YOU CAN DO IT! WE'RE GOING TO GET YOU BACK HOME! But Who IS this A.G. Bear, and Why Is He So Special? A small bear who is at once as vulnerable as a child, but who possesses intuitive insight about people's feelings, A.G. Bear is always, always, a loyal and comforting friend. A.G. speaks Bear. Really. In many dialects, and with a great deal of expression, at that. But only when he has something valuable to contribute to a conversation. Other times, he'll simply be there to listen quietly to what you have to say. You don't DO anything to A.G. Bear to make him speak. He simply seems to understand when it is that you need a friend, or a playmate, or some company, or even a shoulder to cry on. And he's always there for you. Children possess an inate ability to speak fluent Bear. As they grow older, and make the transition to adulthood, however, many lose that wonderful ability. The ones who refuse to forget, are more than likely the grownups whose names you'll see volunteering to join the search party, or those who have taken time out of a busy day to pen a few words of encouragement. If for no other reason than to voice their opinion that children and small bears must always be kept safe and sound, and out of harm's way. A.G. Bear's winsome qualities rocketed him to overnight fame back in the 1980's, and made him a favorite friend of every child he ever met. He also achieved unprecedented popularity with adults. Never before had anyone met a teddy bear who, literally on his own merit, managed to win so many hearts. As of late, A.G. has been happily spending time with his friends, Amanda Gray, Isadora LeChat and Mrs. Duck. But one day, while in search of some honey, A.G. Bear managed to wander off into the woods behind Amanda's Grandma's house, and no one has heard from him since! You know, for a bear, A.G. has got a perfectly awful sense of direction. A.G.'s friends the Police have been looking for him, and the Mounties have too, and so have his friends the Firefighters. But so far nobody's been able to find him. Teddy Bears are sort of small, you know. So it looks like it's up to us, boys and girls. We're forming a Search and Rescue party and we're going to comb the woods. It's been a long time, for many of you grownup kids. Do YOU remember how to speak Bear? If you do, drop the search party a line. Or better yet, join it ! Send A.G. or his friends in the Search Party a few words of encouragement. We'll post your notes here. Once A.G. is safe and sound again, you can invite him to come visit YOUR house. We're going IN, Bedtime-Story Kids! We're going to bring A.G. Bear HOME! See Who's Volunteering for the Search and Rescue Party! Help us rescue A.G. Bear! Send A.G.'s Search Party a message of support! Hey Bedtime-Story Kids, did you know that the A.G. Bear story series is online?. A.G. Bear used with permission of Axlon and Applied Design Labs,Inc. and invite AG Bear to come to YOUR house! Here are the A.G.Bear Books in order. Simply click on the name to go to that story.